I simply cannot believe we’re here again. It was 32 degrees this morning. THIRTY. TWO. I set up the humidifiers in the studio room over the weekend, and the humidifier for the main showroom just kicked on for the first time. IT’S TOO SOON!!! I am not ready to schlep the humidifier bottles to and from the sink room multiple times a day. Hopefully we’ll have a nice warm up in the coming weeks and look back at this as a little blip. Even if it is a blip, actual winter will be here soon. Every professional string player’s favorite season because of all the holiday concerts, but every string player’s least favorite season because of low humidity, open seams, and cracks. No matter how much moisture is in the air outside, once it gets pulled through your furnace and heated up, it tends to be too dry to make your instrument happy. Cellists and bassists must pay attention to humidity through the coldest months or risk the welfare of their cherished instruments. Your house or apartment – if you can humidify your entire living space, your instrument will be happy no matter where it is in your home. The room where the instrument lives – with a small humidifier (I use a Honeywell in our studio room), you can ensure the room where the instruments spends most of its time in is in the ideal range. 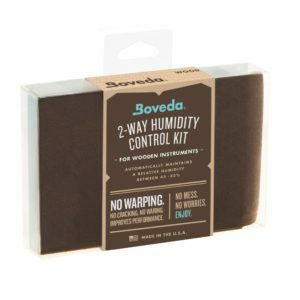 Humidify the case – I’ve started working with the Boveda case humidifier products. These are easy to use packs that you place in the case. They keep the case around 50% humidity. Depending on ambient humidity, they tend to last for around two months before needing to be replaced. There are no syringes, no water to add, etc. I’m going to experiment more with this product this winter, but my initial impressions have been positive. Humidify the instrument? – there are well-known products that go INSIDE the instrument with the goal of keeping the instrument humidified, but they come with their own drawbacks. Putting excessive water in them can have them dripping water inside your prized instrument…not good. Putting not enough water in them means they dry out quickly, adding a spike of humidity before drying out. I do not actively advocate these products because of the potential drawbacks, but I have friends and colleagues who use them and believe in them. As with so many things in life, there is plenty of grey here with room for differing opinions. Always feel free to contact us with questions!